The tree reaches a height of 40 m. The bole may be up to 16 m in length, is straight, slender and cylindrical. Buttresses may be small or up to 3.2 m high. The trunk diameter attains 100 to 120 cm. Julbernardia seretii prefers dense formations, it is often found in small groups. Wood diffuse porous. Occasionally vessels exclusively solitary (over 90%). Tangential diameter of vessel lumina 150 to 200 micras (medium). Vestured pits. Vessels per mm2 less than 6 (rare). Simple perforation plates. Vessel-ray pits similar to intervessel pits Axial parenchyma in marginal or in seemingly marginal bands. Axial parenchyma aliform. Prismatic crystals in chambered axial parenchyma cells and/or in fibers. 3 to 4 cells per parenchyma strand. 4 to 10 rays per mm (medium). Rays non-storied. Rays commonly 2 seriate. Body ray cells procumbent with one row of upright and/or square marginal cells (Kribs-III). Non-septate fibers. Fibers with simple to minutely bordered pits. 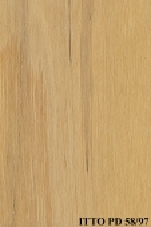 The sapwood is yellow, it has a thickness of up to 30 cm. The heartwood is red-brown. dark or yellow stripes may be present, it is clearly demarcated. It has highly interlocked grain; special care is needed when drying because of frequent risks of distortion. This wood has a somewhat fine texture. 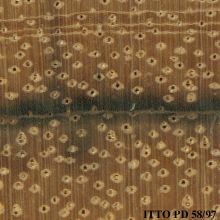 The wood is described as low in luster. Resistant to termites attack. The heartwood is sensible to Lyctus attacks. No growth stresses are reported in this species. Difficult to treat with only a low penetration of the preservative products. Ease of Drying: Drying is very slow and difficult to perform; defects are frequent. Drying Defects: Risks of checks. Kiln Schedules: The kiln schedule has been tested. It is moderately easy to saw. Possible difficulties caused by interlocked grain are reported. Glues well if basic gluing technical rules are followed. 59 - Programa Nacional de uso Sostenible de los Bosques e Incremento a las Exportaciones.